Every day I am more and more proud of my president and the fact that I support him. He is a wonderful human being and a fantastic president fulfilling his promises and comforting the American people all the while taking the slings and arrows of his detractors unimpeded. 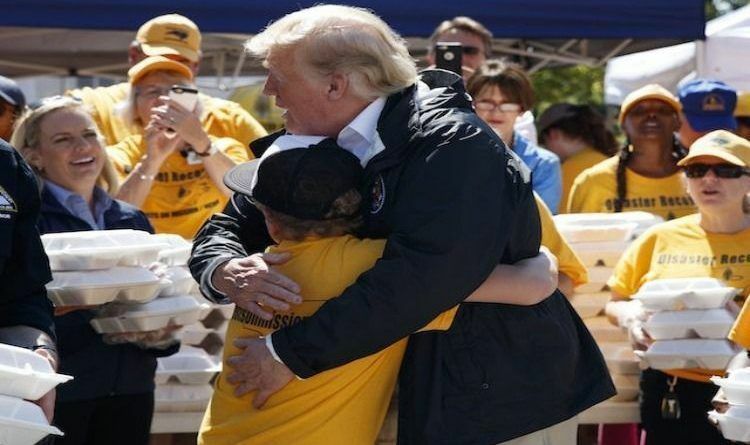 A heartwarming moment occurred on Wednesday, when President Donald Trump toured New Bern, North Carolina, viewing the damage caused by Hurricane Florence. Trump also visited Temple Baptist Church and joined volunteers handing out pre-packaged meals to storm victims. While visiting a North Carolina aid distribution center, a boy asked PresidentTrump for a hug. Immediately Trump embraced the young boy. He may be a President, but Donald Trump is a father and a grandfather. This is our great President representing what a true leader looks like. Doesn’t get better and pure than this. I can’t remember anything happening like that with Obama! Let’s not forget Obama did not want to send help to New Orleans, Obama did not think the situation in New Orleans was worth enough for FEMA to be sent. Yet president Trump has made sure there is going to be money to help the rebuilding effort after hurricane Florence hit America.